The nest-builder is one of our common mud-dauber wasps (potter wasps), probably a Sceliphron like this one. It’s 5mm long and elegantly decorated, but what is it? There is always something new to see on a walk around the park and on our stroll with Wildlife Queensland folk last Sunday I noticed this beautiful little egg dangling from a shrub. Its silken thread suggested to me that it might be a spider’s egg-case (I knew the little dewdrop spiders create similarly rigid egg-cases and suspend them from a thread like this), and everyone knows that caterpillars make cocoons from silk and some suspend them from plants. A little creative internet searching revealed, however, that it was neither of the above but the cocoon of a small parasitic wasp in the family Campopleginae, one of the 1500+ subfamilies of the Ichneumonidae. That level of identification is as close as I will get, but this link will take you to a splendid international collection of photos of the adult wasps. Sometimes I love the internet! Everyone knows about bookworms, even if all they know is the name, but bookworms are not the only small wildlife found in bookshelves, particularly in the tropics, as a recent bout of librarianship associated with repainting a couple of rooms has demonstrated to me very clearly. Wasp nests like these were by far the most common sign of insect life in our bookshelves. Female mud-dauber wasps (Sceliphron sp.) construct a cell, lay an egg inside and provision it with food for their larvae then, if they can, repeat the sequence nearby. 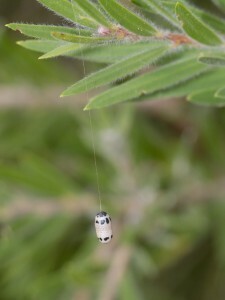 A string of cells like this will have been constructed in a short time (days or weeks) by a single wasp and, if all went according to plan, her children would have emerged and followed suit. The empty cells stay there for ever but don’t cause any real harm. They are just dirt, and nearly all of it will brush off. The easiest prevention is to push books all the way to the back of the shelf, making the gap too small to be tempting. The wasp will probably build a cell in a corner of the shelf instead. 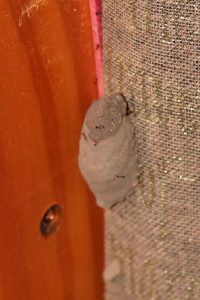 Mud wasp nests are so common around our house that we hardly notice them until they do something odd but the resin bee nests did surprise me. 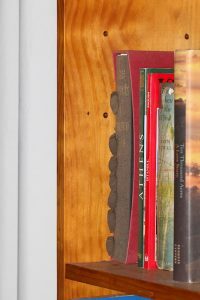 The pine bookshelves are adjustable, via a double row of holes about 5mm in diameter down each side for the shelf brackets. 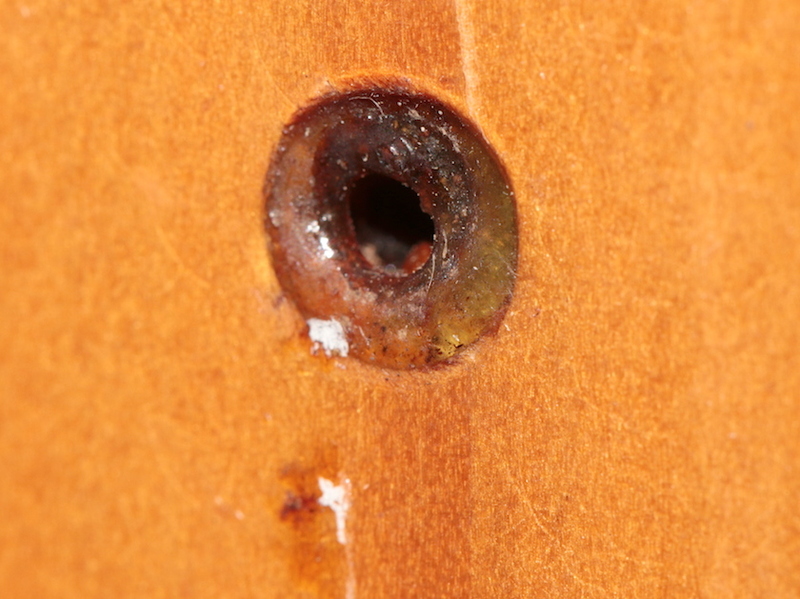 The empty holes seem to have been just right for our Fire-tailed Resin Bees (the second species described here). 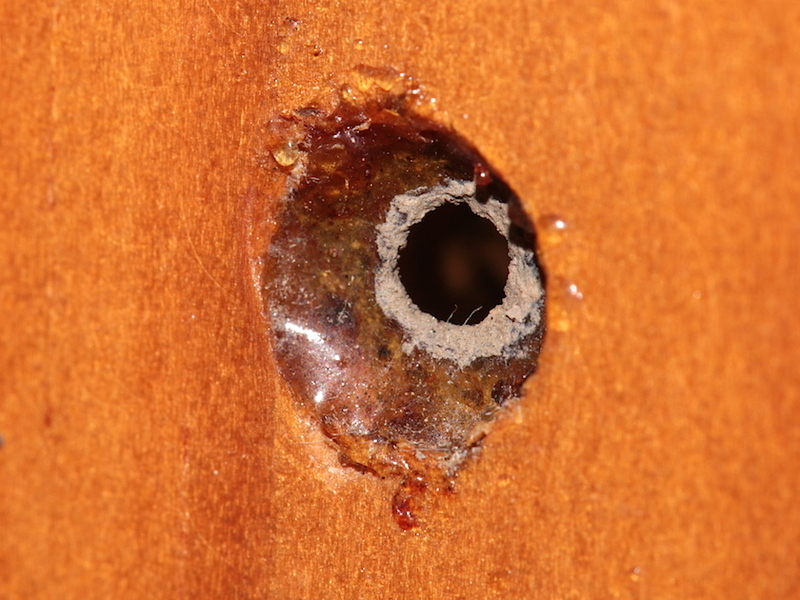 In turn, the empty resin bee cell seems to have been just right for a tiny mud wasp to build its own cell. 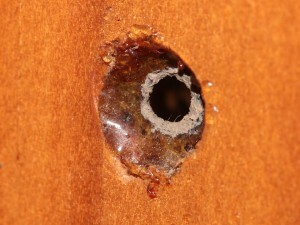 We often see tiny nests like this in odd nail-holes and screw-holes and, less often, in resin bee nests outside the house. The resin bees are not doing any harm here except that the shelves are no longer so adjustable as they were meant to be. The resin is very tough, so removing it may mean drilling it out. Our books don’t suffer as much from silverfish here as they did in Melbourne, I think because our climate is (usually) too dry for their liking, but this is their typical handiwork (mouthiwork? 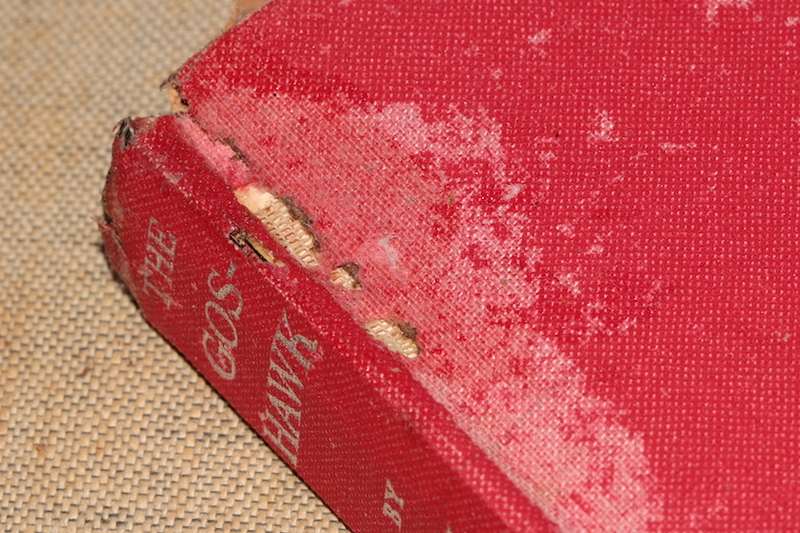 ): superficial nibbling at the cover or dust-jacket, sometimes extending deeper into the bulk of the book. 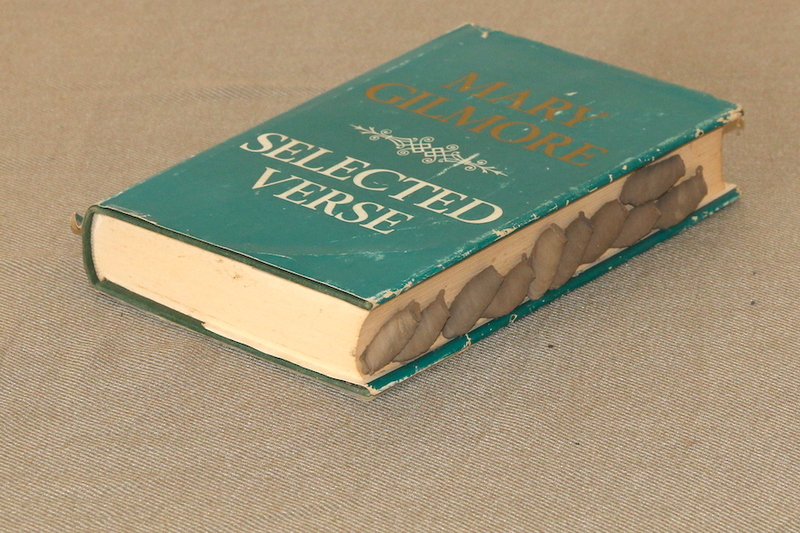 This damage may actually have occurred in Melbourne – we have had the book that long. More specifically, however, bookworms are the larvae of beetles. 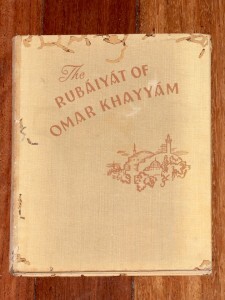 Their damage is more distinctive than they are: tunnels one or two millimetres wide, often though book covers and sometimes through the pages, with a scattering of sandy droppings tending to fall out when the book is handled. They are the most destructive of our book pests, and a book has to be really special before we will go to the trouble of trying to save it from them. 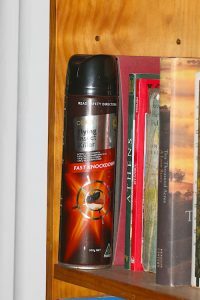 They are not very choosy and it is obvious that one of ours veered out of its book and into the side of the bookshelf. Online references such as “Bookworms: The Most Common Insect Pests of Paper in Archives, Libraries, and Museums” compiled by Dr. John V. Richardson Jr., PhD, Ecological Informatician (nice specialisation!) list various other pests but we don’t see many of them. Spiders, often Daddy-longlegs, sometimes lurk in corners of the shelves but do no harm at all; “booklice” (Psocoptera) don’t seem to be a problem here (again, probably because our climate is too dry) and cockroaches don’t go near our books except by accident. 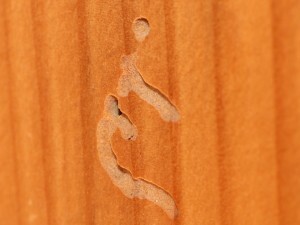 Dr Richardson also mentions termites and these can indeed be a problem in North Queensland. 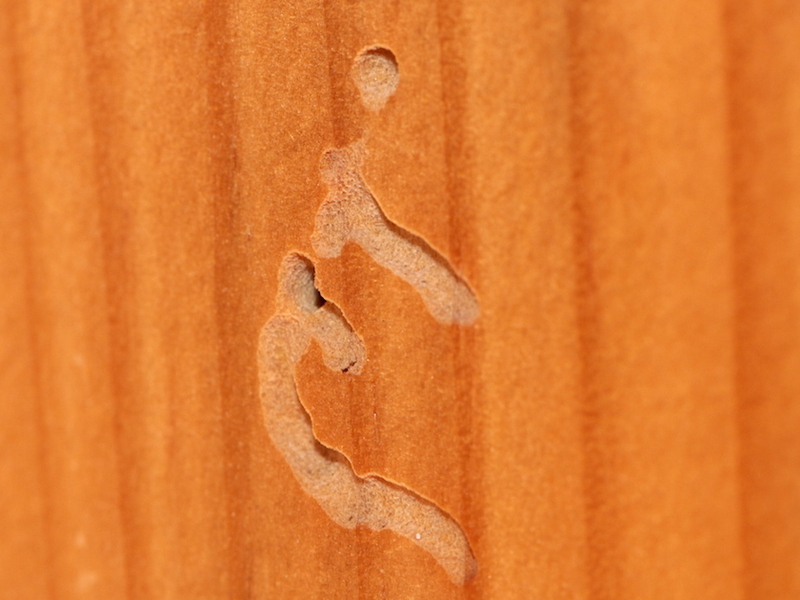 There is a wonderful passage in Alex Miller’s Journey to the Stone Country in which visitors to an abandoned homestead investigate a bookcase and find that it has been transformed into one solid mass of termite-mound. I will leave you with that thought as I return to my re-shelving.